UCLA Health System and the Sound Body Sound Mind Foundation have formed a partnership to provide practical ways to combat childhood obesity and promote healthy lifestyles in Los Angeles. The new entity, UCLA Health Sound Body Sound Mind, funded by a $3 million pledge from Sound Body Sound Mind, will replicate the foundation’s existing program model. The announcement was made today at North Hollywood’s East Valley High School during the unveiling of a new, state-of-the art fitness center provided by UCLA Health Sound Body Sound Mind. Dr. David Feinberg, president of the UCLA Health System, left, and Cindy and Bill Simon. 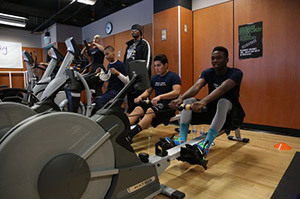 UCLA Health Sound Body Sound Mind will provide under-resourced schools with commercial-grade fitness equipment and an innovative curriculum designed to build students’ competence and confidence in a range of physical activities. The $3 million gift will enable UCLA Health System to expand its preventive care solutions among the city’s most vulnerable adolescent populations. The project exemplifies UCLA Health System’s commitment to community engagement. Anastasia Loukaitou-Sideris, a UCLA professor of urban planning and associate dean of the Luskin School of Public Affairs, also has collaborated with the Robert F. Kennedy Community Schools to evaluate the effectiveness of the Sound Body Sound Mind curriculum and find ways to improve community health through additional research and publications. According to the Los Angeles County Department of Public Health, 42 percent of children in L.A. County are overweight or obese and therefore have a higher risk for serious chronic health problems. More than one-third of children and adolescents were overweight or obese, according to a 2012 study by the Children’s Defense Fund. 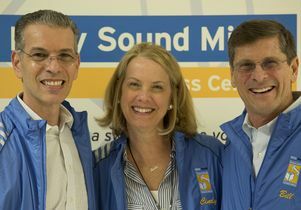 Founded in 1999 by philanthropists Cindy and Bill Simon, the Sound Body Sound Mind Foundation is dedicated to helping students live healthy, balanced lifestyles. The foundation has donated fitness resources to 89 schools in Los Angeles, reaching over 92,000 students each year. Sound Body Sound Mind offers a variety of physical education services at no cost to schools, including state-of-the-art fitness equipment, fitness curricula, and professional development for educators. In 2013, the Los Angeles Unified School District designated Sound Body Sound Mind as its premier fitness provider. UCLA Health System has been a leader in patient care, medical research and teaching for more than 50 years. Today, its physicians provide an array of cutting-edge and research-based primary and specialty services in four hospitals on two campuses, and in numerous outpatient clinic locations. The system’s Ronald Reagan UCLA Medical Center has been ranked among the top hospitals in the United States for 20 consecutive years by U.S. News and World Report. UCLA Health System treats approximately 1.5 million patients through its clinics and more than 80,000 patients through its hospitals each year.